While sandwich shops like Juliebelles will satisfy you if you want a good chicken cutlet or steak sandwich, there is no substitute for a good old fashioned Jewish deli. And one of the best in the New York area (and therefore, the world), is an unassuming little shop right here in Great Neck. 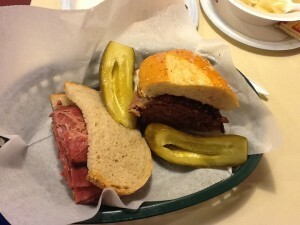 The first time I heard about Kensington Deli, I was telling a Jewish friend of mine how much I enjoyed Ben’s in Carle Place. He chuckled at me and said that if I wanted a real deli sandwich, I absolutely had to go to Kensington. The deli itself is rather unassuming. When you walk in, you immediately see the hot dogs cooking near the window and a deli case full of everything from cole slaw to various salads to chicken cutlets. And of course, lots of pickles. At the counter, you see stacks of small potato pancakes. When we walked in we were greeted in a gruff (but not unfriendly) manner. 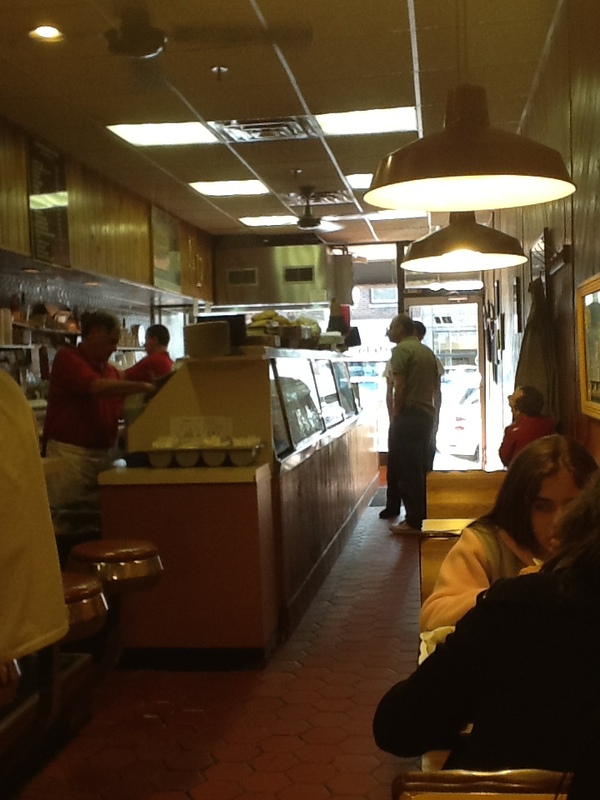 We were led past the deli case and past a row of barstools to a tiny booth for two. This is the kind of place where you’re expected to know what you want right away, so study the menu. I asked the server what the most popular sandwiches are and he looked at me almost incredulously. They are, of course, the pastrami and the brisket. I decided to have one of each, taking the former on rye (of course) and the latter on a baguette. Just for kicks, I also ordered a matzo ball soup and a potato pancake. That would really let me judge this place again Ben’s. Out came the matzo ball soup. As expected, this was the kind of soup that grandma would make, if my grandma were an old Jewish lady. The soup was unbelievably fresh, with egg noodles, chunks of real chicken, and fresh carrots, celery, and onion. 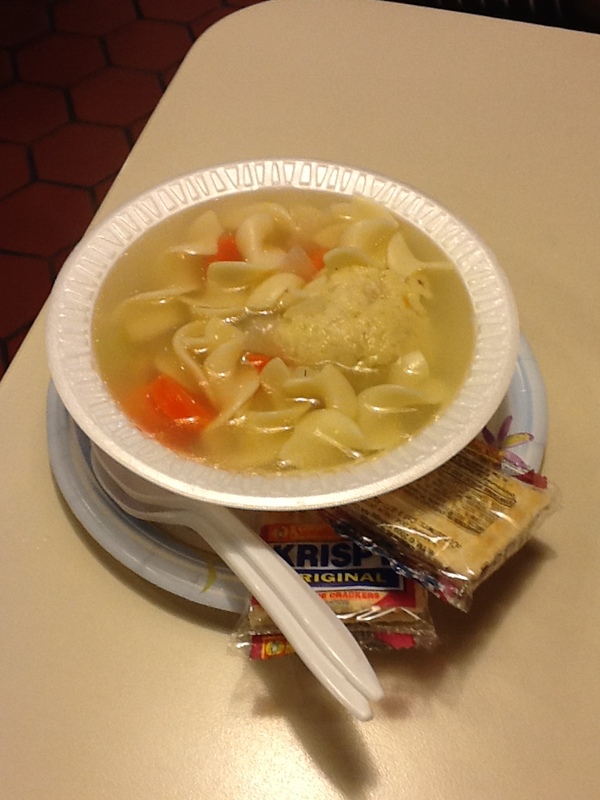 And of course, that beautiful matzo ball soaking up all the soup. In general, the portion size seemed smaller than what I was used to at other places, and the presentation wasn’t as good (it came in a cheap plastic bowl). But I had no complaints about the soup itself. 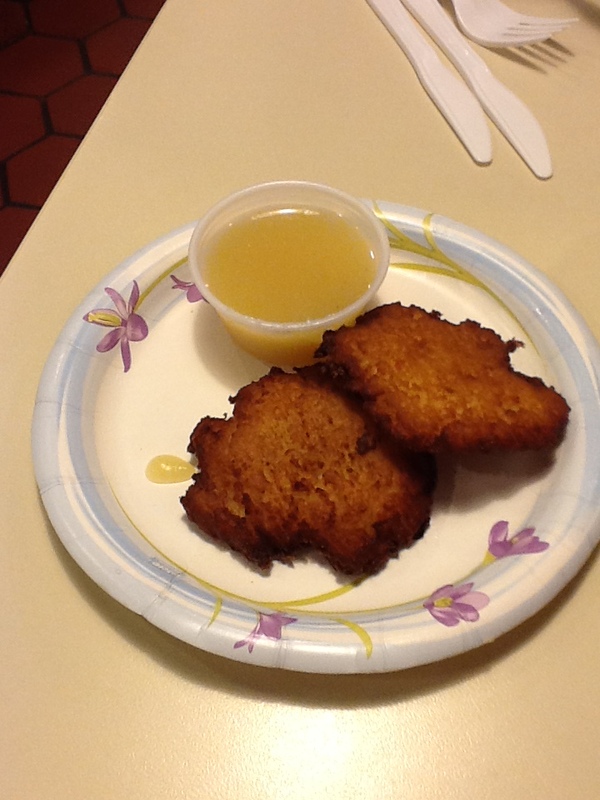 Next came the potato pancakes. I have to admit, these paled in comparison to Ben’s. They were small, thin, and didn’t really have much of a taste as compared to the big fried monstrosity they serve at Ben’s. Still, I believe these are closer to traditional potato pancakes. Finally, the sandwiches came out. I started with the pastrami. I’ve had pastrami all over (as I do with Pad Thai at Thai restaurants, the pastrami on rye is my standard order when judging delis). The pastrami at the Kensington Deli was, bar none, the best I’ve had anywhere. While pastrami at other places taste salty or greasy or filled with preservatives, the pastrami here was superbly fresh. 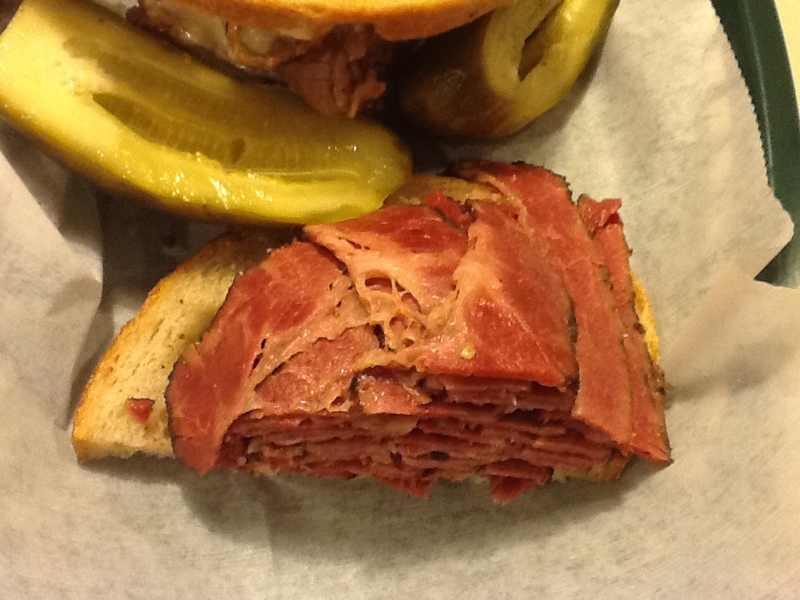 It wasn’t too salty and wasn’t too greasy, which really let the pure flavor of the pastrami come through. It was great on its own and just as great when I slathered on some spiced mustard. The rye bread was also soft and fresh. I thought the portion size was just right too–while other delis load up their pastrami sandwiches to the point where you break your jaw trying to eat it, this sandwich seemed perfect. Again, I was blown away. 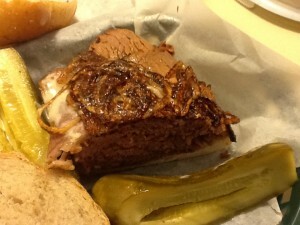 The brisket was sweet and tender, albeit a little dry. But when combined with grilled onions, natural gravy and horseradish sauce, it was an excellent sandwich. In both cases the sandwiches were head and shoulders above what I’ve had anywhere else. Weeks later, I was passing by the Kensington Deli and had to try the third of the triumvirate: their hot dogs. I decided to place an order “to go”. This time, the gentlemen behind the counter were a lot friendlier. 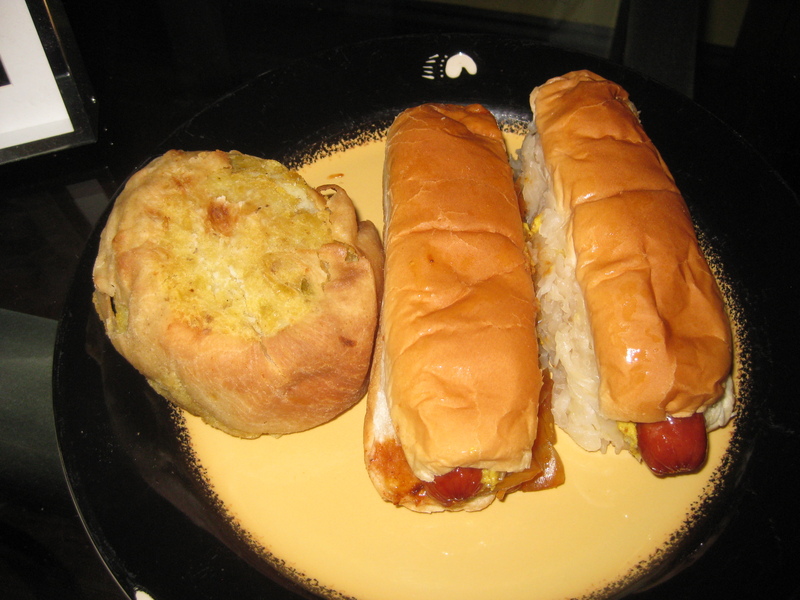 I placed my order: two dogs and a knish, with sauerkraut and mustard on one, and onions on the other. I brought them home to eat for lunch, and it was a real treat. The hot dogs had a wonderful “snap” to them, as Hebrew Nationals are known to have and were plump and juicy. They are among the best dogs you can have in the city. And another great thing about them–I had parked in one of Great Neck’s metered across the street and pressed the button for their “5 minute grace period”. I got my lunch and paid for it with 2 minutes to spare. I don’t hand out 5 star reviews lightly on this site, but Kensington’s Deli easily gets a 5 stars out of 5 from me. If you’re in the good for a good deli sandwich, it’s worth a trip from wherever you are. Follow us on Twitter to see the newest unbiased reviews, and to be among the first to hear about GREAT NECK SPECIFIC deals on Groupon, LivingSocial, and those other daily deal sites! Plus One us on Google! Copyright © 2019 Great Neck Eats. All Rights Reserved. The Magazine Basic Theme by bavotasan.com.